As mentioned in an older post we recently had an Italian house warming party and as well as the almond cake I was also in charge of making salt and pepper squid. 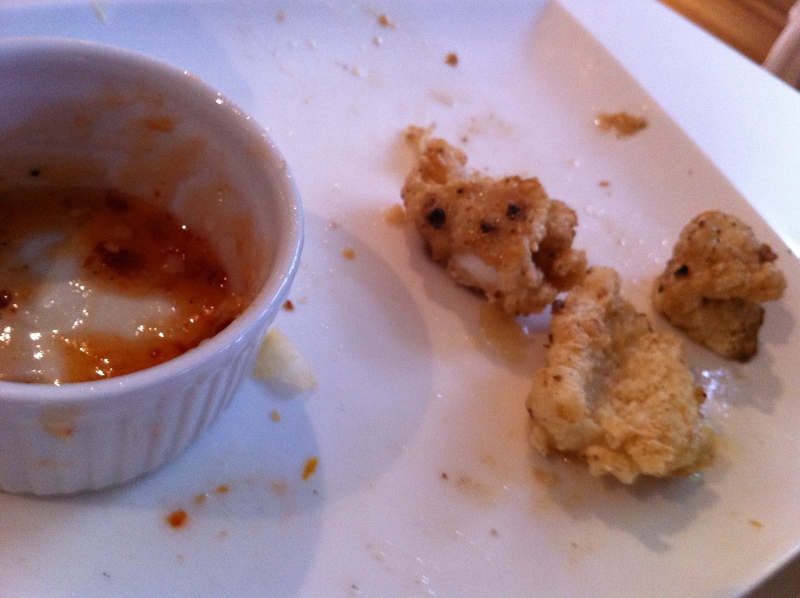 I love salt and pepper squid and since most places don’t make it gluten free I was excited to try my own. I decided on a recipe from De Costi which I found here. While the salt and pepper is reasonably easy to make it is very time consuming and uses a lot of oil and paper towels. I had to change the oil every 3-4 batches as it got too dirty from the loose flour and pepper. However, it is definitely worth the time as both times I made it it was a hit! As you can see in the photo below it was almost finished by the time I had the chance to take a photo. Open out the squid tubes, wash and pat dry. Lay on a chopping board with the inside facing upwards. Score a fine diamond pattern on the squid, being careful not to cut all the way through. Cut into pieces about 5 x 3 cm (2 x 1 1/4 inches). Place in a flat non-metallic dish and pour the lemon juice over the top. Cover and refridgerate for 15 minutes. Drain and pat dry. Combine the cornflour, salt, white pepper and sugar in a bowl. Dip the squid into the egg white and then into the flour mixture, shaking off any excess. Fill a fry pan with about 1cm of oil and heat up. Cook batches of the squid for 1-2 minutes, or until the flesh turns white and curls. Drain on paper towels. Serve with sweet chilli sauce or lemon. Can you be bothered with fiddly and time consuming recipes or do you prefer making quick and easy dishes?